Last week, our Forum Q&A discussion was about saying goodbye to piano students before moving away. Today, I’d love to hear your thoughts about students who are perfectionists. We’ve all had them! Sometimes they are so hard on themselves when it comes to making mistakes that they stop having fun. They may even stop making progress in their piano study as a result of their intense fear of making mistakes. On the other hand, as a professor at my alma mater once said, music is one of the few professions where perfection is not only expected, but it is considered the norm. We have to admit, our goal is perfection in a way. And so, I think a balance is necessary. What are your thoughts? What can we do about students who become too hard on themselves? How do you help the perfectionist student become “okay” with making mistakes? How do we help students achieve a balance when it comes to reaching perfection? Here in Ohio, the winter snow is finally upon us! We were spoiled with an extraordinarily mild December, and only recently have have had a few inches of snow actually staying on the ground for more than a few days without melting. At our last Forum Q&A discussion, we talked about new year’s resolutions for piano teachers! Click here to view the responses. Have you ever had to move and “give away” all your students? How did you break the news? 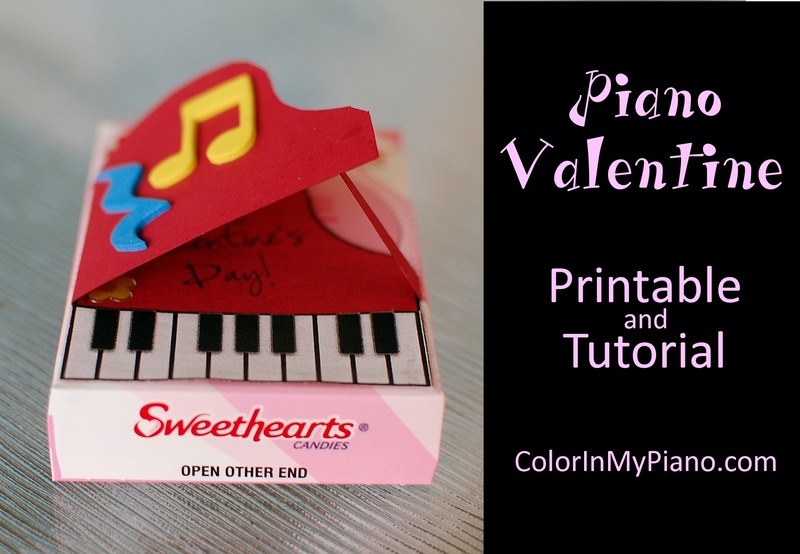 Was there anything you were able to do for your students to make their transition to a new piano teacher easier? What other advice can you offer to a piano teacher who is preparing to move? I’ll post my answer in the comments below, including the “goodbye letter” I wrote for my students last Spring when I moved after graduation. Please add your own thoughts to the comments below! Here’s a first composition created by one of my young students last week. It’s called “Hush Little Squirrels.” I love her inventive notation system! You can see the black key groups of 2’s and 3’s pictured, and the L’s and H’s mean high or low. I was so proud of the work she put into creating and notating her piece. For Christmas, my friend and colleague Loretta gave me the Wee Sing “Games, Games, Games” book with music. I’ve been using it with my Homeschool Music Class with great success! We typically do a lot of sitting as we learn about composers, listen to music, and learn about the musical instruments. So I always find it’s important to come up with a few games that allow them to stand up and move around the room too. This Wee Sing book makes it much easier to plan movement activities! So far we’ve tried the “Looby Loo” song and the “Pass the Ball” song. For “Pass the Ball,” students stand in a circle and pass the ball with the beat. The sound of the tambourine is the signal to pass the ball the other direction. The music goes faster and slower at certain points, which makes the kids get very excited! 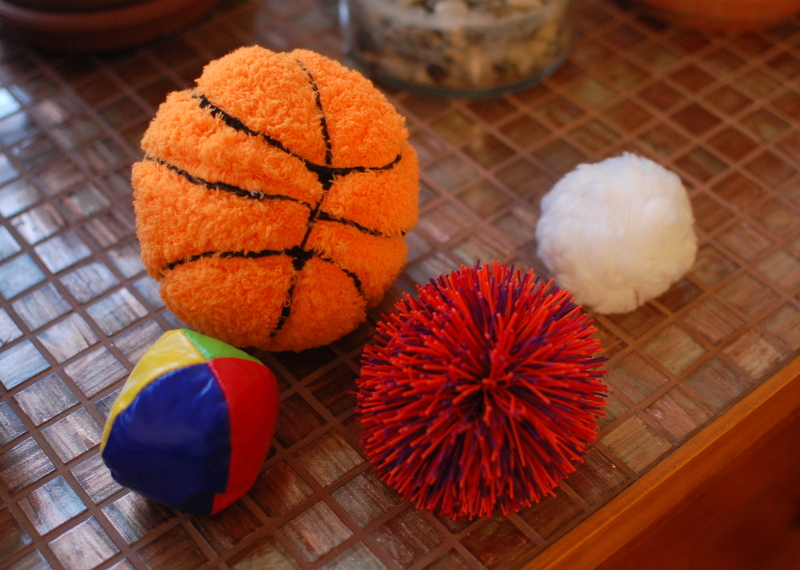 I got out a bunch of different little balls to pass, just to keep things interesting: a plush basketball, a Nerf ball, a fuzzy craft ball, and a juggling bean bag. You can find the Wee Sing “Games, Games, Games” book with CD on Amazon. 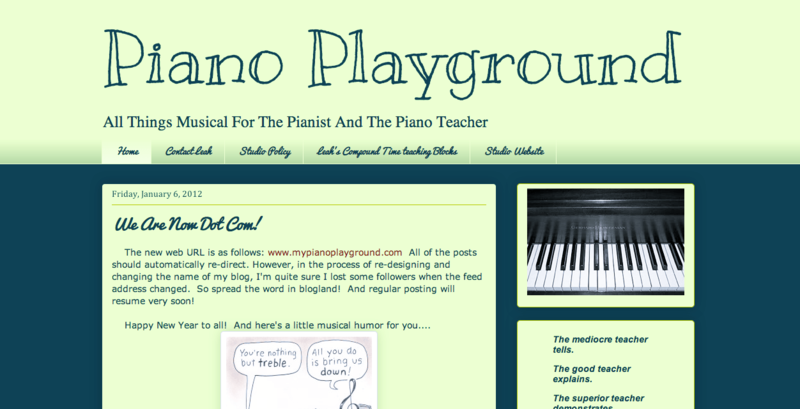 Leah’s “For Love of Piano” blog has moved, gotten a facelift, and a new name! You will now found her blog at MyPianoPlayground.com.